Agar Scientific's standard grade grids are available in gold, nickel, copper, or in copper with one side coated with palladium for identification purposes. Agar also supplies special metal grids in a range of other metals, including aluminium, molybdenum, titanium and stainless steel. All grids are supplied in tubes of 100, unless otherwise specified. 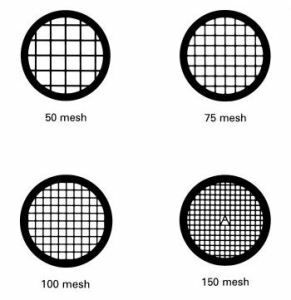 All grids are available in 3.05mm diameter - some grids are also available in 2.3mm diameter. For more information about Agar Scientific's EM grids, please visit their website.